The boxer dog breed is categorized by the American Kennel Club under the working group and as several other dogs with a past as working dogs, their tail was docked for practical purposes. Despite the fact that many boxers today are kept as pets, the tail docking procedure, performed during the pup's first five days of life and without anesthesia, remains popular but for different purposes than originally meant. Dog tails are meant to have many purposes. Back in time, docking the boxer's tail had a precise purpose. Utilized to hunt wild boar, deer and bear and to hold them down until the hunters arrived, the boxer's ancestors traditionally were cropped and docked so large wild animals couldn't get a hold of them. Years later, when boxers were utilized as guardians, their ears and tails were still cropped and docked but this time to prevent intruders from grabbing on to them. 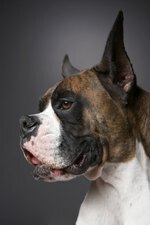 While tails in show-quality boxers are often docked to conform to breed standard and avoid severe penalization, tail docking remains popular even outside the ring. By docking tails, fanciers create a distinctive appearance while perpetuating a tradition. Happy tail, a medical condition where the tails of short-coated dogs with exuberant temperaments become injured repeatedly by banging against a wall or crate, is often cited as a reason for docking a boxer's tail. Left natural, the boxer's tail may grow too long and narrow and making it prone to injury. The American Veterinary Medical Association opposes tail docking of dogs done solely for cosmetic purposes and encourages the removal of tail docking from breed standards. The procedure, which involves cutting through nerves, tendons, muscle and sometimes bone or cartilage, is painful, and provides no obvious benefits to the dog, which relies on its tail for communication purposes, balance and stabilization of the vertebral column. Veterinarians are noticing a decline in the amount of puppies going for this type of elective surgery. At this time, the tail docking procedure is banned and restricted in many countries. Breed standards have been changed to reflect these changes. The United Kennel Club allows a natural tail as long as it's in balance with the dog and a normal length, while the Fédération Cynologique Internationale, calls for a tail of normal length and left natural.